*For use with Deluxe or Wish Tables Only! 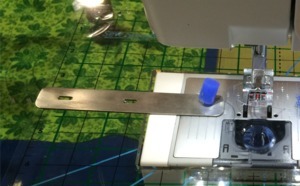 Sew smaller and larger circles with a Deluxe or Wish Table using the New Circle Sewing Tool! 4” Metal Tool locks into existing holes in the Deluxe and Wish Tables. Provides a very simple solution for sewing many sizes of circles. New tool sews circles that are 4” smaller and larger than can be sewn today with Wish and Deluxe Tables. Intended for use with stabilizer. 4" Tool Designed for use with Sew Steady Deluxe and Wish Tables provides simple effective solution for sewing 3/8" apart circles ranging from small 2" to over 20" in size. I love the Sew Steady Wish table & received it faster than expected. Thank you for awesome service. Sew Steady Custom Clear Acrylic Insert for Freearm Sewing Machine Cabinet Top Platform Opening Sizes, Made in the USA!